When the "veils of Maya" are parted, in Tantric thought, if only for one illuminated moment, the mystical unity of form and consciousness is revealed. In Hindu homes, a visitor is traditionally greeted with the same gesture as that used to initiate prayer - Namaste - because guest and host are one in the true dimension of being. God is meeting God. To pull back the "veils of Maya"has been the inspired quest of Alex and Allyson Grey. The Greys, who have a daughter, Zena, live in New York City. Both have achieved international recognition as painters and performance artists, and they have founded the Chapel of the Sacred Mirrors in New York City, where the series is housed, and events and performances are offered. Alex is also the author of THE MISSION OF ART, an important book about art and spirituality. Although they often collaborate, Alex and Allyson have their own distinct styles and visual language. Allyson's intricate paintings are abstract, unlike the visionary figurative work of her husband. Her Spectrum Series, which I was fortunate to talk with her about in 1988, was composed of prismatic squares. There is an underlying white grid that runs throughout her work, sometimes visible, sometimes not. Allyson compares the squares that compose her paintings to cells, which like the cells of our bodies make up a living whole. Her prismatic squares are about form: they could be planets dancing between the stars, atoms disassembling, or human beings. In her diptych Chaos and Order, Allyson Grey describes the ever transforming dance of energy and matter. And what lies beneath is Light. Her grid is spectral white light from which all colors come, and to which they return: "Luminosity, the white light, the perfection thread that runs through all beings and things." The Sacred Mirrors, by Alex Grey, with collaborations by Allyson, is a group of 22 paintings that took Alex almost 10 years to complete. They are works of amazing dedication. 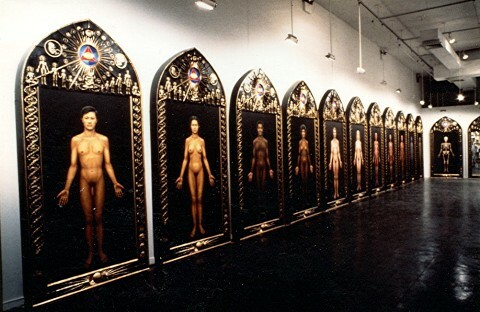 They were first shown as a complete installation at The New Museum in New York in 1986. and since that time have toured museums around the world, to finally be installed in The Chapel of the Sacred Mirrors, a project the couple spent years planning. There is also a book, THE SACRED MIRRORS (1990), with commentary by Alex Grey and Ken Wilber.